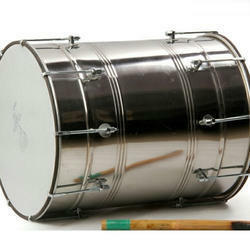 We bring forth our vast industrial experience and expertise in this business, involved in providing Baby Dhol. - Tasha Dhols in different shapes & quality available for festive bands set. This Dhol Instrument is specific to the region of punjab in north india and used for traditional folk dances and songs. made of hard sheesham wood, it is shaped like barrel. one side has a sheet of good quality plastic stretched across it for a treble sound. MRUDUNG (Pakhwaj) - Wooden, Leather Strap Fittings. 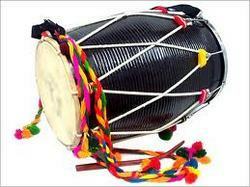 Special model dhol made of well-seasoned wood Fitted with nut bolts on one side and dori on the other side, special plastic puri on trible side and leather puri on base side of dhol. Our entity is offering an extensive series of Bhangra Dhol. Experts make this product as per worldwide industry norms. e have a team of Dhol players, which performs both traditional as well as western Dhol for our clients depending upon the mood and theme of the occasion. The team performs as per the requirements of our clients. Synonymous with Punjabi music, especially nowadays, it is a large two sided drum made of wood. The left side is coated to give it a heavier sound. Tightened cords with metal rings keep the sides taut and wooden sticks are used to play it.